On August 27, 2018 a Quiz Competition NEC-TALENTIA 2018 was conducted in Kovilpatti for the students of classes 6.7 and 8. Schools from the Tuticorin, Tirunleveli, Virudunagar and Kanyakumari District participated in this Quiz. Our Students Kalyani of class 8 and Srivatsan of class 6 represented our school. These budding stars with their outstanding and bubbling performance brought laurels to the school by getting First Place in the Preliminary level and the Finals. Winners of Mahatma Gandhi Quiz ! Government of India is commemorating the 150th Birth anniversary of Mahatma Gandhi, The Father of Our Nation by conducting various constructive activities. 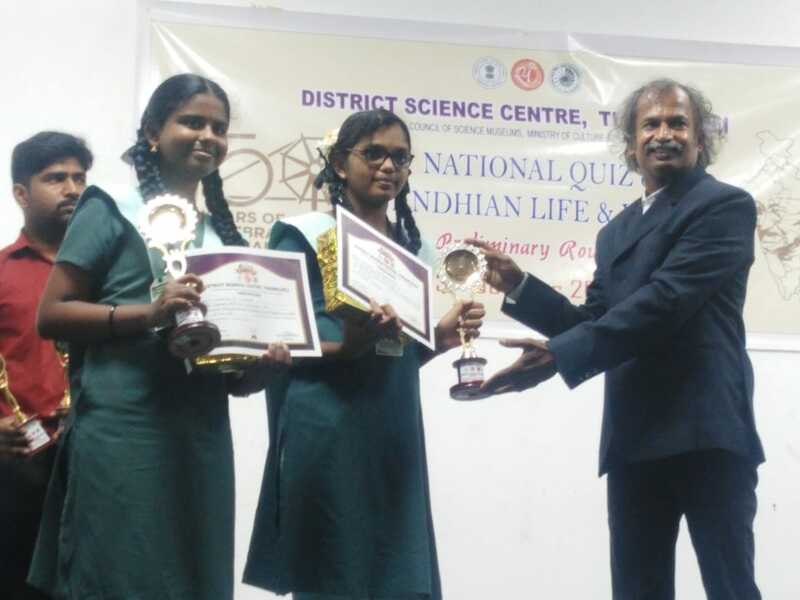 As a part of it, the District Science Centre in Tirunelveli Conducted an Inter School Quiz Competition for School Students on October 3, 2018. The same was conducted on the same date across the country by the National Science Museum. The first prize winners will be representing their zone in the National Finlas to be held in November 2018. Our Students Sanjana and Induvarsha of class 9 participated in the quiz conducted here on October 3rd and won first place. Apart from answering usual questions from the life of Gandhiji, they were able to perform very well in the rounds like “ Quotes Of Gandhi”, “Photo Gallery” “Works Of Gandhi” etc., They are preparing vigorously now to take part in the National Finals.